Our homes are where we spend most of our time. Even people who travel a lot usually have places to call home. These buildings are very special, considering you can do anything you want there. While some people use it to just put their possessions in, it can house so many things that you love and care for. However, like all possessions, it must be taken care of. It can last for decades in great condition or it can crumble beneath unconcerned attitudes. Constant upkeep is important if you want your home to last a long time. Even if you travel a lot, it’s important to come back to take care of it or have someone do it for you. A monthly or bi-monthly checklist of maintenance is an important thing to make. Following it every month or two can prevent things like water damage. Water damage will weaken a home’s structure and produce mold if not taken care of. At its simplest term, water damage is when something is damaged by water. This can be inside, outside, or wherever you might find moisture where it shouldn’t be. The official definition that is given to us by many restoration experts is that it is the moistening or impairment of the function or visuals of material from immediate touch of water or contamination in the water. This can either be permanent or restorable. Whenever something gets damaged by water, it gains a very visible splotch. This splotch, usually brown or tan, shows that there is a leak somewhere. This can lead to cracks or breaks in the surface, possibility of mold, and more. Water damage can come from many different places. It can come from broken or weakened pipes, holes in the roof, humidity, or even floodwater. There are other things to keep in mind when looking for water damage in a house. There are many ways to replace or restore items from this sort of damage. You can protect wood from water damage, but ceilings, walls, and flooring are different stories. The blotchy brown marks are very visible and can show more signs of damage in the area. Mold is also another big problem, since it can grow from moisture. Because water can sometimes carry dangerous microbes, it’s easy for the fungus to take hold. There are many ways to repair water damage. However, it can be difficult to get rid of those brown splotches that remain even after you’ve dried the water-damaged areas. Unless you remove the affected area completely, you’ll have to paint over the splotch. If you have damaged drywall or a water damaged ceiling, you should make sure that the area is no longer damp. Trying to paint over water stains that are still damp will lead to the chance of growing mold or mildew. Covering up mold will only cause it to spread more and possibly get in other areas of the house. If the area is still damp, be sure to let it dry after covering up the leak or fixing the pipe that may have burst. You can use a fan or heater to assist in the drying, but if it is peeling or cracked, it should be replaced regardless. Drywall is difficult to save, but it can be dried if necessary. Prepare to paint and safety measures. When prepping for painting over the affected area, make sure you cover any of the other areas that are not going to be painted. Make sure the area is well-ventilated by opening a window or placing a fan near one. This will assist in taking out the noxious fumes that might make someone sick. Remember to always wear goggles and a dust mask when painting or spray painting. Make sure that you apply a primer for the paint that you’re about to use. Primer isn’t always necessary, depending on the paint, but it’s a good idea. It makes sure that the paint doesn’t chip away or rub off easily, so it’s a benefit to put it on. 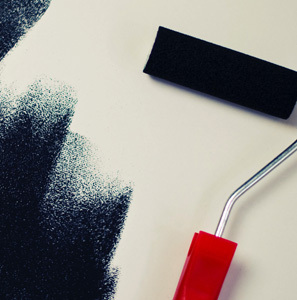 Using a paint brush or roller, apply the paint vigorously over the area. When it dries, it’s not a bad idea to paint over it once more with a finishing coat. It can be difficult to match the exact color, so it’s possible you may need to paint the entire wall if you can’t match it. 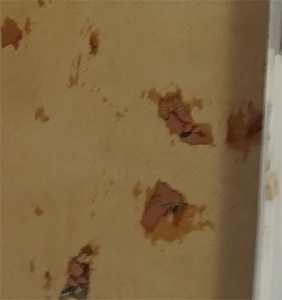 Water damage is bad, but the brown blotches are visible signs of a problem. If something is leaking or draining incorrectly, the water stain can be ugly on your ceiling or walls. Drying the area is one thing, but the stain will remain. Until you either paint over it or remove the area completely, it will be visible to everyone. After it’s dry, put primer over it and then paint it as much as you want. There are many things you can do to prevent water damage. Mold can grow after water damage, so be sure to dry it or remove the affected area. It must be done quickly; otherwise it will cause the mold to spread elsewhere. Get a professional’s help if you are unsure about it. There are many people who can assist with these problems, but beware of unlicensed and uninsured companies. Because if they are not licensed and insured, what happens if they do the job wrong and you end up with a full blown mold outbreak? Make sure you're getting a legitimate company with an office and staff. If you're in the Orlando Fl area, give us a call. If you are in other locations across the U.S. and need help finding a qualified contractor in your area, give us a call, we'll help you find a legitimate contractor in your area and get them in touch with you quickly. In most cases, we can have your local experts on the phone with you within minutes from the time you call.